When performing SEO, it all comes down to metrics. The metrics of your domain or websites, compared to the metrics of your competitors. The more positive metrics your site has such as Backlinks, Social Shares, Web Page Speed, Indexed Pages etc means the better chance you have of ranking on search engines and being found by potential customers. So it’s critical to have a tool that lets you check and evaluate metrics. 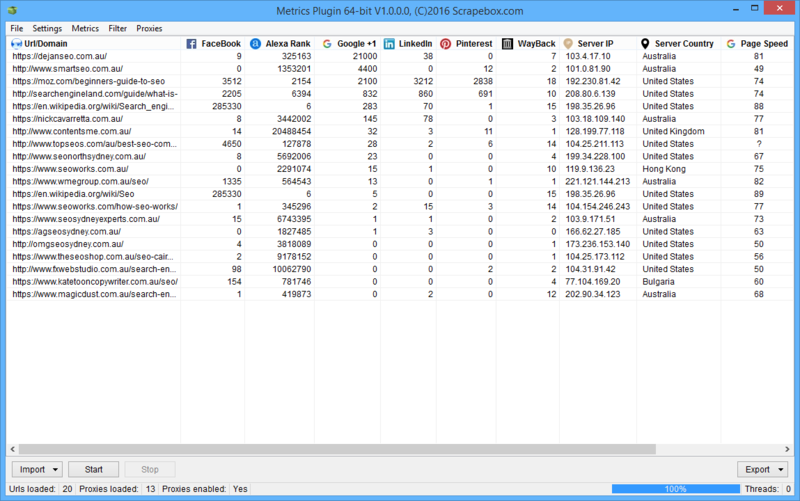 The ScrapeBox Metrics Checker Plugin is a fast and multi-threaded research tool for gathering a large variety of metrics. 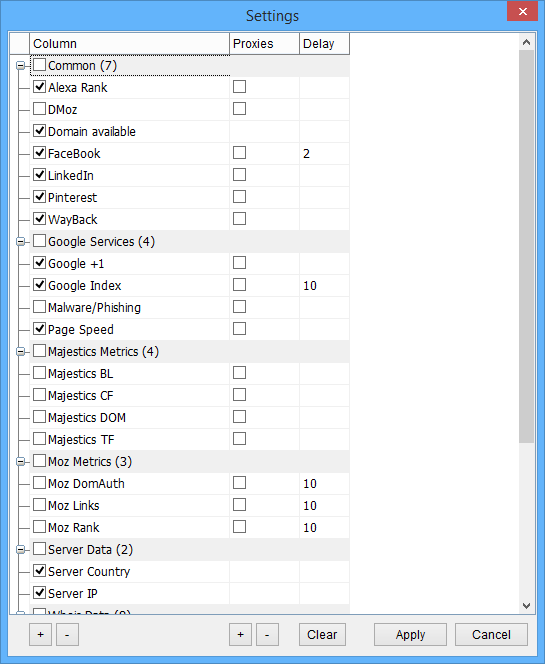 All metrics can be bulk checked, so there’s no limit to the amount of domains or URL’s you can check. Choose from numerous domain and page metrics. You can check URL’s with popular services such as Moz.com, Majestic.com, FaceBook, Pinterest, Alexa, WayBack, DMoz. As well as gather metrics from Google Page Speed, Google Indexed Pages, Google +1 and fetch Whois information and server details such as Server IP and Country. Each metric can be individually enabled and disabled, and a custom delay can be used on each metric to avoid excessive lookups. Also all metric lookups feature proxy support allowing you perform more lookups with services that have IP based lookup limits such as Whois. Note: Moz and Majestic require an account to use those services. Once completed you are able to sort all metrics, filter invalid entries and then export all metrics to an Excel file for further analysis. The Metrics Checker Premium plugin is only available to owners of ScrapeBox, to purchase you must be running ScrapeBox v2.0 or higher to access the “Premium Plugins” option in the menu. From here you can select “Available Premium Plugins” to purchase, and to download after you have paid as well as download plugin updates. Also note the Metrics Checker Plugin is a lifetime “per user” license, so if you have multiple ScrapeBox licenses registered to the one email address purchasing the Metrics Checker once will activate the plugin for all your ScrapeBox licenses with the same email for life. The plugin is a one-time payment and is not a monthly or yearly subscription, all updates are free. View our video tutorial showing the Metrics Checker Plugin in action. This feature is a premium plugin available from the “Premium Plugins” menu in ScrapeBox. Also check our YouTube channel for hundreds of other ScrapeBox video tutorials.